Most already know the drama that was up and running in the past couple of weeks. Once we published Ben's Story (click HERE to read), and the Corinthians official statement (click HERE to read) there was a whole lot of mess. We took the luxury of not publishing "The Closing Word" sooner, as we wanted to write it without any influences on the side, as well as, we wanted to take out the time for observing what's going on. We have talked to over 30 people, and we got to hear the good and the bad. We followed on what's happening in the Brazilian football community via Facebook groups, as well as publishings via other media sites, where we'd like to give thumbs up to "11 Jardas", guys you're doing a great job! Maurice Lovett, QB. Maurice was one of the first people to reach out and support Ben in public while the team board was running a whole campaign via FB in attempts to lower Ben's credibility. Maurice's experience was rocky. He was attacked by an armed man, where after bringing it up to the team board - all he received was nothing more than laughs. Also, Maurice was accused that he was buying/selling drugs. Looking at that situation - why would an IMPORT get himself in possible trouble like that in a foreign country? Let's say hypothetically that was the case - why weren't the authorities informed? But, besides that, Maurice has been receiving messages that he will be sued if he speaks up. 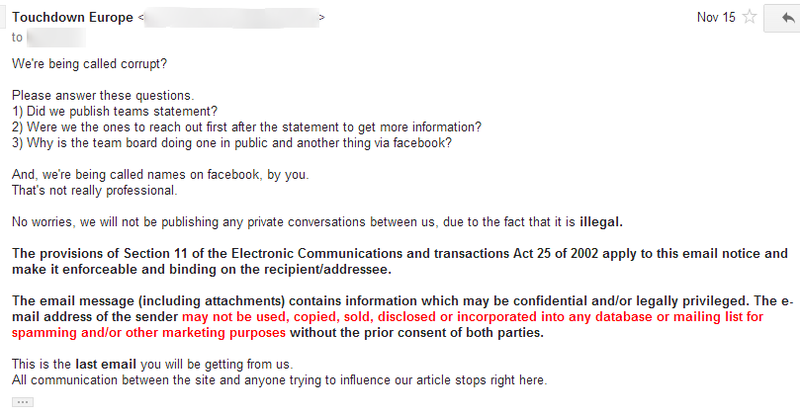 Since we do not publish private conversations due to the fact that it's illegal, we are not able to post a screenshot. He tried warning Ben, but, Ben believed the boards story and was excited to sign with the Steamrollers. Maurice had bad reviews on his Europlayers profile by the team, and, we're more than happy to say that Maurice's story vs Corinthians got a happy ending. After one year, Europlayers have deleted teams feedback, and approved Maurice's feedback on the team profile which was pending for a year. We're fully aware that Maurice will be getting a new wave of "comments", and, note that we have checked his story via multiply sources, and that we are focusing on his experience with the Corinthians. Now, Ben Jones. His story raised a lot of drama. Private messages were being published. Threats were received. For the ones who don't know who Ben is - we've been following Ben's career for couple of years now, and we know how dedicated he is, first hand. One of the situations where he put the team before him (as everyone should do) is while in Croatia. He had a bad injury, his foot was completely swollen. He didn't care, he played the game, and worried about the recovery after the last whistle. Ben is known for promoting American football in Europe, and is well-respected in the European football community. Speaking of Croatia, we have received couple comments from a Brazilian IP address that was signed as "Zagreb Thunder". But at the same time, both articles we've published - if you check comment sections - both good and the bad is on there. Team sent different screenshots on Ben's case. We've received a Declaration, not a health insurance policy. Unfortunately, in this case, a declaration is a piece of paper where it's stated that team will be paying for medical treatments. This is just like a contract. We all know that contracts imports sign are not too valid, since most are there on a tourist visa. Declaration is not an insurance, it's based on the good will of any team whether they will breach this declaration or not. Same goes for the contract. When it comes to the salary - one is stated and another thing was payed. However, both team and Ben need solid proof of these payments. If it's cash, and it was, it's hard to trace proof we could publish. Team has enclosed a copy of the flight ticket. We're only publishing the flight dates of the return ticket, Ben's name and information is below, which is the reason we're not publishing the whole ticket. No personal information may go public without subjects written approval. 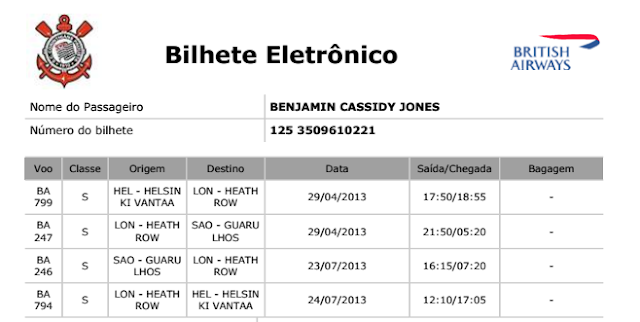 Ben arrived in Brazil April 29th, as it's written in the ticket. So this information is true. However, return flight is booked for only 3 months later, while the season in Brazil ended not too long ago (Nov/Dec). If you look at the return date, ticket was for 3 months only. Ticket had to be for that period of time since any team in Brazil is legally obligated to buy a return flight due to avoiding the regulations. Ben was not on that flight as he returned to USA couple months after where he was the one to buy the ticket. Vantaa, let us know if you saw Ben in July. Could Ben reschedule the flight? In EU, not really, however we're not sure about Brazil. The original ticket you see was not payed by him, and therefore he can not handle this ticket without the person and/or organization that payed for it (in EU terms). It came to our attention that the ticket could be changed, but still, the board had to be contacted. We can not say for sure if this screenshot is a legit proof of practice attendance. We've found out that if you visit the Sports Club as an athlete, you may be let in through the side gate to practice and gym. Sometimes you just don't have to scan your card. But, let's say, hypothetically, that the claim is true as all we have is the information we managed to obtain. In that case there should be a paycheck cut like it's stated in the contract, with a written notice. Even if there was a paycheck cut, Ben received a whole lot less. There was a mention that Ben had a driver. He did have a person, something like a courier, driving him to the practice for the first 3-4 weeks. While the team board stated it was for the whole period of his stay there. The only statement we got from Ben is also his last one on this matter: "I had to make a decision to stand up against a perpetual abuse and manipulation of the imports in the best way I knew possible and that was to share my personal experiences while I was there. I will no longer be responding to any accusations or baseless public slander. I have refrained from using anyone's names, posted private conversations, manipulated fake evidence or posted "unanimous" hate messages claiming different things from the same IP address like the Steamrollers have done many times. Instead I am just going to leave you with these small clarifications and put this situation behind me." We wanted to hear from the team board, however, it turned out to be a bit ugly. We initiated the first contact and asked for a Skype interview. However, we couldn't schedule the exact date/time. 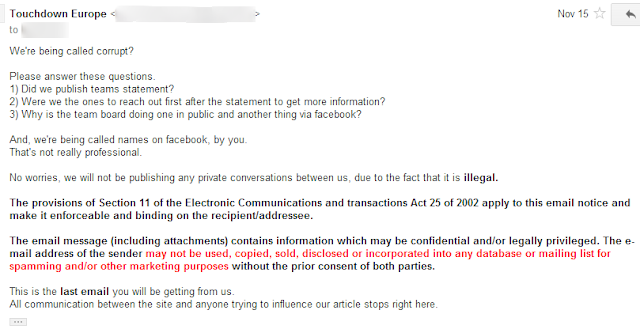 As we have already mentioned, publishing private conversations is illegal, so, we'll just post a screenshot of our last e-mail. If the team board would like us to post their responses, please do let us know, and we'll be happy to edit this article. We have blurred the correspondents name, as we want to respect their privacy. You can click on the image to enlarge it, it will open a pop-up window. Not everything is bad. Hands down to the team board on their work of establishing the team. Corinthians Steamrollers are a part of a Corinthians soccer organization. Being under a soccer team (and we all know the popularity of soccer in Brazil) is huge. Access to different things such as media, sponsors etc. is nothing but hands down to the board. From all the statements we have collected - team president is a business mind. He will go and get the job done. He will knock on a door until it opens. That's rather hard to find nowadays. Team president is determined. He was the one to get sponsors, who took the football team to the soccer team. So when it comes to working on the teams business in general, he knows his stuff. Corinthians Steamrollers are a team who don't know what a loss means. Although football in Brazil is still far from being on a decent level - it's evolving and going towards big things. Props to all the players and coaches doing a great job in getting the level of the game higher out in Brazil. Some of the issues with imports started when LFA was being formed. 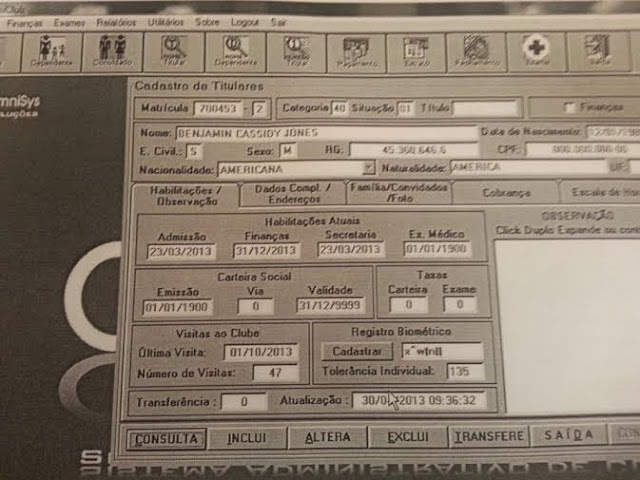 LFA was supposed to be the first Brazilian professional football league. Read about the LFA shutting down before the first kickoff HERE. LFA owned the rights for the National Team until just not too long ago. Since LFA was looked at as competition (at the time when it was still "alive"), Steamrollers players were forbidden to go to the tryouts. In one way, it can be understood, but then again, if the players are receiving no salary, they can't be forced by the team board to do or not do something. Some of the key players left the team. This years import QB of the team, was kind enough to give his insight as well. At one point both him and Ben weren't satisfied with their situation and wanted to talk to the board. For some reason situation was handled separately. He did mention that he arrived later than Ben, and said that Ben did lots of traveling during his recovery time. Ben did travel and everything is posted on his Facebook. However, imports do travel a lot during the time when they don't practice or play games. Also, QB did mention he heard a lot of wild stories from the imports who were a part of the team before, however he decided to have an open mind and had no issues thus far. One thing triggered our mind, is that there were 'wild stories' before. Of course we went to see if those were true. We found out that some of the imports were fired through social media in public. Biggest issue is basically respect and discipline, which we hope team board will work on, as it's an issue that can be handled within weeks. There were situations where import players would be paying for their own hospital bills and so on. 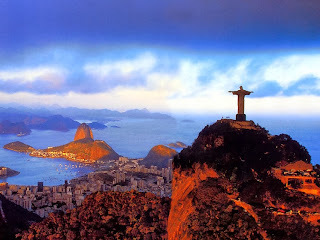 Most of our Brazilian sources were bringing up the discipline. There have been various fights on and off the field, and we don't mean the players. However, one time a player punched a female ref OR her elderly mother in her face (Some of the sources said it was the ref, some said it was her mother, however, some of the sources witnessed it, and, whoever got the punch - hitting a woman!?). Team handled it by saying their lawyers are the ones to be contacted. Also there were issues of racists comments etc. Now, we're not trying to put a bad light on Brazil and American football there. The sport is growing, and we're excited to see the league developing. We're not trying to trash the players, as we haven't done any of that not before, and not now. We wanted to get to the bottom of things, and if the board needs to handle their business towards the players, especially imports, in a better manner. It will be shared via FB that we're a corrupted group that wants to shut down football in Brazil. - We think we cleared that one up. And no one even mentions football in Brazil in general, plus we did a fair share of promoting football in Brazil in the past, and will continue to support the growth of the league. We're focused on the problem here. Everything will be denied and the names mentioned in this article will receive another dose of threats and insults. We will receive e-mails, however, none will get a response. We're all done with this topic. We truly hope this article will be looked at as a constructive one, especially since it's written in that manner. We will be threatened with a lawsuit unless we take down the article. Our advice would be to stick with doing one thing and to stick with one story. Future imports should be treated right. There is no need to put out a statement and then do a complete opposite of the statement via Facebook. Defending the honor is one thing, insulting is another. As TDEU we mean no harm, and our last year of work speaks louder than words. We love the game and we will continue to highlight great things in football after this article. *Due to the fact that on previous 2 articles we were receiving comments from the same IP addresses over and over, now you have to register in order to post a comment. Note that we won't approve any insulting comments. ONLY CONSTRUCTIVE COMMENTS WILL BE APPROVED. If you agree or disagree with something make sure to write it in a respectful way followed by why you feel that way - it has to contain concrete information!